Facebook announced earlier this year plans to make news on its mobile app faster, through a new platform called Instant Articles. The system pre-loads most of the article before the user clicks, shaving eight seconds off the average load time. The firm is officially launching Instant Articles on iPhone today, making the super-fast articles available to everyone using the app. 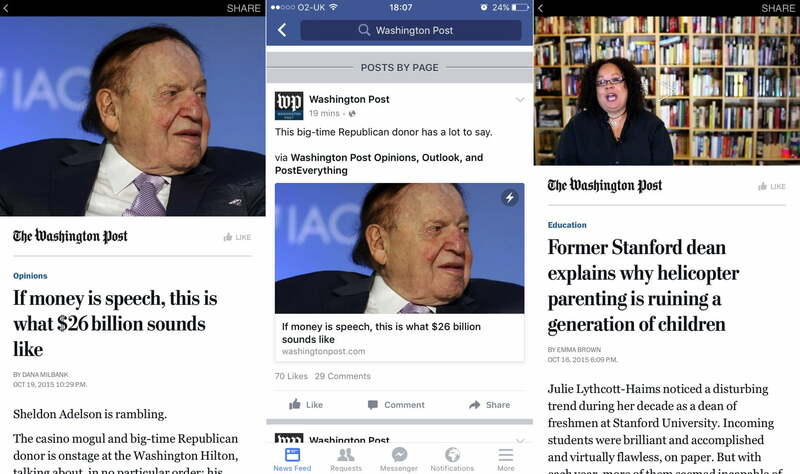 Facebook also announced that The Washington Post, The Onion, The Verge, and a few other publishers have joined Instant Articles. On the News Feed, a lightning bolt will appear on the top right of a supported news article. Inside of the article, auto-play videos, a like button, and Facebook adverts are embedded. The speed is super-fast, similar to the speed on a native video or “show more” post. Facebook maintains a singular aesthetic for articles. A header image or video, followed by a break filled with the publisher’s name and a like button, then the article headline, followed by the author and date. To make the system so fast, Facebook uses both of the cores on the A8 and A9 iPhone chip. It is similar to the technology used on Paper — Facebook’s News Feed redesign experiment — which was built by the same team that created Instant Articles. Android support is planned for sometime later this year. No word on Windows Phone support, and our guess would be after 2015. Facebook claims that supporting Instant Articles is in a publisher’s best interests, since it provides more views, more shares, and more interaction. It sounds like a win-win, but some publishers are worried that by giving the social network more control, they could fall into a Zynga-situation, where an algorithm change kills most of their traffic. Plenty of publishers joined Instant Articles before the official launch to test the waters, including The New York Times, Washington Post, and Buzzfeed, so we assume those worries were not enough to prompt their resistance to the new platform. Facebook is not the only tech company that wants to make articles faster on mobile. Google, Apple, and Twitter have all announced new platforms. Twitter Moments is a new curation service to find the latest news, Apple News is a new RSS-type feed, and Google is working on Accelerated Mobile Pages (AMP) to make the mobile Web faster. Each of the new platforms wants to assist publishers in earning more views and revenue, and to create better conversations. The difference is that Facebook and Twitter want the conversations to happen inside their own networks, rather than spread across the Web.